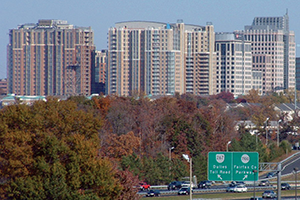 The Reston skyline in Fairfax County. Fairfax County is an economic juggernaut. Nonetheless, one of its biggest assets, proximity to Washington, D.C., is becoming a liability. With a median family income of $124,831 in 2011, Fairfax is the second-wealthiest county in the nation. Its unemployment rate for July, the latest month available, was 4.3 percent, one and a half percentage points lower than the state average. The county is home to 10 companies on the Fortune 500 list. The group likely will grow to 11 when Hilton Worldwide becomes a publicly owned company. The county accounts for 48 percent of U.S. government contract dollars awarded in Virginia, more than $24 billion in fiscal year 2012. More than 6,700 technology firms employ more than 144,000 workers in the county, making it the largest concentration of technology jobs of any major U.S. market. In addition, the reach of the Fairfax County Economic Development Authority would be the envy of many state governments. It has U.S. offices in Tysons Corner, Los Angeles and Boston, and foreign offices in Bangalore, London, Seoul and Tel Aviv. Likely as a result of its overseas presence, the county is home to nearly 400 companies from 42 countries. The Fairfax EDA seems to have a Midas touch in reeling in business prospects. It usually bests frustrated competitors in the District of Columbia and Maryland in any contest for a highly sought-after prize like the Northrop Grumman headquarters, which relocated from Los Angeles to the Merrifield area in 2011. One of Fairfax’s best selling points has been its location just outside Washington. Northrop Grumman moved its headquarters to be closer to its biggest customer, the federal government. Being near the capital also is the reason that more than 300 trade groups and professional associations have their headquarters in the county. But proximity to D.C. also means being subject to the erratic vicissitudes of the federal government. While Fairfax has succeeded in diversifying its economy in recent years, about 14 percent of its residents are federal government employees and many others work for government contractors. The Fairfax County EDA says the commercial real estate vacancy rate in the county in June was running 16.9 percent, up from a normal level of 10 to 12 percent. That represents about 18 million square feet of empty space. In addition, the number of Fairfax homes in foreclosure rose 144 percent in September, the largest increase among counties with populations of at least 1 million, according to Bloomberg News. The culprit in both cases is sequestration, the 10-year, $1.2 trillion cycle of automatic budget cuts to defense and domestic programs that Congress and the president blundered into earlier this year. ”Sequestration has had a trickle-down effect, dampening confidence and creating an atmosphere of uncertainty,” says Gerald Gordon, the president and CEO of the Fairfax County EDA. The Washington-based Bipartisan Policy Center told Bloomberg News the jump in foreclosures was caused by “sequester pain” felt by federal employees facing furloughs starting in June. Fairfax’s high vacancy rate and rising foreclosures were recorded before another political impasse caused a partial shutdown of the federal government beginning Oct. 1. Virginia, which is home to more than 170,000 federal employees, was expected to be the state most affected by the shutdown, although the damage would not be known until revenue data were announced in late October. Fairfax’s experience under the shutdown could make a difference in that state total. The county is a net exporter of state revenue, getting back only 19 cents of every state tax dollar it generates, according to the Fairfax County EDA. The sad truth is that many other local economies in Virginia, few of whom have Fairfax’s advantages, also are paying the price for the government’s senseless, self-inflicted wounds. The meat-ax cuts of sequestration, for example, were supposed to be so indiscriminate and “stupid” that no fool, Democrat or Republican, would allow them to be enacted. Virtually every Virginia elected official opposed the defense cuts because of the effect they could have on the state economy. The idea behind sequestration, hatched as a bargaining move in the 2011 debt-ceiling crisis, was to force the opposing parties to the negotiating table to craft an intelligent process to cut federal spending. That didn’t happen, so sequestration took effect by default. The last-minute deal that reopened the government and narrowly avoided economic catastrophe resolved nothing, setting the scene for another test of brinkmanship this winter. The same sort of slow-moving political train wreck led the partial government shutdown and threatened to push the government into default. During the shutdown, former Indiana Sen. Evan Bayh told an audience at the College of William and Mary that political compromise once was considered an art. Now, he said, it is condemned as an act of betrayal by fringe elements in both parties. Politicians pride themselves by standing by their principles but accomplish nothing for the good of the country. The result is a federal government that lurches from crisis to crisis with no coherent plan. If the Washington Redskins are looking for a new team name, I have a suggestion: the Washington Gridlocks. That says it all about their hometown.